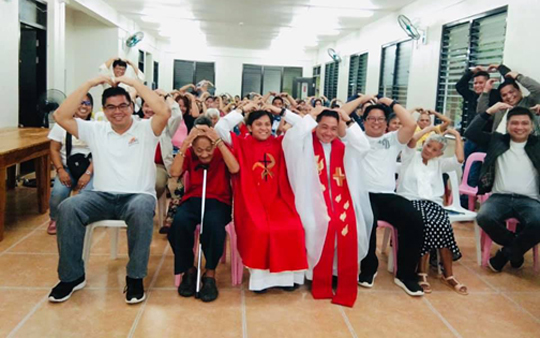 Tacloban City—A group of former seminarians has initiated a reunion through a gift-giving activity at the Pope Francis Complex Center for the Poor and the Elderly in Palo, Leyte. Sacred Heart Seminary’s Syzygos-Amadeus Batch 1999 holds a reunion through a gift-giving activity at the Pope Francis Complex Center for the Poor and the Elderly in Palo, Leyte. Florencio Diloy Jr, president of the Sacred Heart Seminary’s Syzygos-Amadeus Batch 1999, said the activity is their one way of sharing their blessings. Joining the event were Ryan Rey Lim Pasagui, board chairman; Patrick Enage, vice president; Fr. Paulino Cabahit, treasurer; and class members Jude Acidre, Art Nuevo, Rafael Soro, Jayvee Paul Tuazon, and Gerald Stephen Tuazon. Cabahit celebrated the mass together with classmate Fr. Ivo Velasquez and Fr. Philip Park, the director of the Center. Cabahit said that while their group can only do it once a year, the people behind the Pope Francis Center do it every day out of love. After fellowship lunch with the former seminarians, the abandoned elderlies and orphans received a free haircut, pedicure, and manicure, courtesy of Cristina Learn and Earn Program (CLEP) of Tacloban City Mayor Cristina Gonzales-Romualdez. Other generous donors also contributed to the success of the event by providing diapers, slippers and hygiene kits. “In sharing our blessings, we are even more blessed by the time spent with the residents of the center,” said Acidre of his experience during their recent gift-giving program. “Amadeus is a compound of two Latin words, ‘Amare’ which means to love and ‘Deus’ which means God. To love God is what inspired this class of ‘yokemates’ to carry out this project and make this yearly class gathering a lot more meaningful,” added Acidre, who is now the second nominee of Tingog Sinirangan party list. The gift-giving event was also supported by Tingog, Leyte First District Representative Yedda Romualdez and her husband-former Leyte First District representative now LAKAS-CMD President Ferdinand Martin “FM” Romualdez. On January 17, 2015, Pope Francis came to the town and blessed the center for the victims of the 2013 Super Typhoon Yolanda (Haiyan). The Korean-based Kkottoongnae Sisters of Jesus was tasked to manage the complex. Kkottoongnae or “Flower Village” in English is a “community of love and salvation” founded by Fr. John Oh Woong-Jin in 1976.